Writing for the web is very different from writing for print. Most online readers do not actually read text on the internet; instead, they scan the text to pick out valuable bits. That’s why creating scannable content on your website is crucial to getting your message across. Inspired by Eddie Shleyner’s HubSpot post, here are some tips for creating effortlessly readable web copy. Prioritize Key Information – Your reader wants information, and they want it right away. Provide the most important details at the beginning of your article, and include less important information near the end. Be Concise – Avoid overloading your content with unnecessary details. Provide what matters, and cut out irrelevant information. Headlines and Subheadings – Content structure is vital to scannable content. Use informative headlines to attract readers and section your content using subheadings – particularly subheadings that contain questions to which your reader needs answers. One Idea Per Paragraph – Use one main idea for each paragraph to highlight throughout three to five sentences. Paragraphs help you break up lengthy blocks of text into a few shorter ones. Large Type and Bold Text – Use a large enough font size that is easily readable. Bring attention to important keywords, ideas or critical steps using bolded text. Graphics and Captions – Strategically place images and videos to support information found in your article – infographics and animated explanatory videos are perfect for scannable content. Include captions to help give readers more context. Bullet Points or Numbered Lists – Long lists are excellent for organizing large amounts of information. Use short lists for information that can be delivered without a sentence. Long lists and short lists are both great for scanning, so use them whenever appropriate. White Space – Walls of text do not make for quality scannable content. When writing for your website, include white space to make your content more readable for your audience. Active Voice – Write in the active voice because it is it easier to read and understand. “Always write in the active voice” is written in the active voice; “the passive voice should never be used for your content” is written in the passive voice. To grasp the value of the above tips, let’s take a look at a before-and-after example from Nielsen’s study. What this means for your website is that scannable content could result in better reader engagement and a higher chance of conversions. 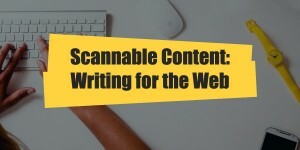 Using these elements can improve your content but it is important to test just how scannable your content is. There are a number of tools online that you can use to test your document’s readability and scannability. You can find some readability services online for free (such as Readability Score), and many others for a small fee. If you own Microsoft Word, you can use the program’s built-in readability feature to analyze your content. Brad is an Account Director at Graphically Speaking, one of IABC/BC’s fantastic sponsors. Graphically Speaking specializes in cost-effective web solutions for B2C and B2B companies. This post was originally published by Graphically Speaking in July, 2016. What also makes Brad amazingly special is that he volunteers on the Chapter Board as Director, Sponsorship and Advertising. Got any other good examples of great content or useful tools to share?